Forbes India in its sixth edition announced 30 Under 30 list emphasizing the country’s young business leaders and professionals who have pulled their way beyond passion, grit and potential. Interesting aspect is our own Vijay Deverakonda, 29, got place in the elite list. 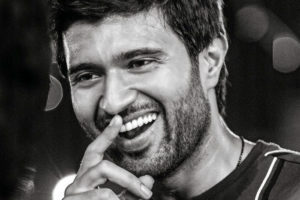 Vijay Deverakonda whose profession is acting is listed under the category of Entertainment & Music. The actor as we all know is not restricting himself just to acting. He is venturing into production with a film to introduce his friend-director Tharun Bhascker as an actor, after establishing his own textile brand called ‘Rowdy’ which has become a prime choice for youth. It is a rare scenario that, a non-film background celebrity going places and hitting headlines for all good reasons. And Vijay Devarakonda besides enjoying his best phase in career is inspiring others to push their limits to do something extraordinary in life. On the film front, the happening hero is presently starring in couple of films- Dear Comrade under Bharat Kamma’s direction and an untitled flick helmed by Kranthi Madhav. Vijay has lined up few other films and he has no qualms to work under debut directors. He is expected to make his debut in Bollywood and successful makers like Karan Johar is keen to introduce him in B-Town. Next articleNaidu using AP Intelligence to spy on Jagan in Hyd!